Imagine this: You’ve had a long day at work. Your back is stiff. Your feet are sore. You can’t wait to get back home. The smell of clean sheets and the feel of a soft bed is all you can think of. Isn’t this picture just tantalizingly perfect? Seductively alluring? After all, a good night’s sleep is a sign of a successful professional. But having the right accessories to compliment your beautiful sleep is a fundamentally important aspect of your forever anticipated good night slumber. The mattress of your bed, whether the best latex mattresses or memory foam mattresses, is like the foundation of a fortress. If it’s not a strong robust one, chances are, the overall structure will not be as stable either. Therefore, getting the right mattress to fit your needs is the first step in achieving sleep nirvana. Why do you need a good mattress? A good mattress will be the perfect combination of comfort and support. But these two important factors are not based on a universal assumption and can vary significantly person to person. What may seem comfortable to one individual may not necessarily be the right one for the next individual. But how can one determine and test a mattress for the right support and comfort? If you don’t want to wake up feeling tired and sore with a possible back ache, it is important that you look for a mattress that will hold your body in proper alignment. This means you need a mattress that will naturally push up your body from head to toe in order to counter your body weight adequately. However, that doesn’t mean you need to go for a mattress that is rock solid! A mattress that naturally contours to your body’s shape and holds it upright in its normal alignment is the one to go for. This is because your body is not naturally straight and getting a mattress that supports the curves and arches of your body will help you slumber better without any precipitating aches and tiredness. Have you ever woken up feeling like a train wreck? Well chances are your mattress is not providing your body with the right support which is hindering your comfort levels. A comfortable mattress will never cause too much pressure on your body and not make you change your positions too frequently. If your mattress is too hard, chances are its cutting off your blood circulation by pinching your nerves hence, the fragmented sleep. However, the best way to assess a mattress’s comfort levels is by lying on it in one unitary position for some time. If you are comfortably able to do that, then you’ve got yourself a keeper! When you have the support and comfort levels of any prospective mattress figured out, there are a few more factors that you can look into to compliment the primary factors (support and comfort). One of the hardest things in life is sharing a bed with someone. Without a doubt, the bed is a sacred place that should be given the due respect of a shrine. However, if you have to share a bed with someone then it will be a great idea to make sure your mattress is certified for minimizing motion transfer. Getting out of bed or even changing motions should not have an effect on your sleep. And the best way to test this is by trying out different mattresses at the retailer with your partner. Have him or her switch multiple positions to check how much it gets transferred to your side. You don’t want the surface of the mattress to match the temperature of your body. In fact you want it to be comfortable and regulated. So make sure your prospective mattresses is thermo-neutral and doesn’t retain any excess heat. A great supporting edge will make sure you don’t roll off the bed in your sleep. 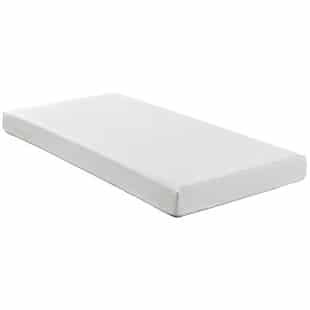 A foam encasement around the mattress is a great support to hold you up especially if you tend to sleep or sit near the edge of the mattress. Once you understand all the important factors to keep in mind when mattress shopping, it is time you move on to more intricate aspects, for example, the type of mattress that will suit your body and provide it with the right support and comfort levels. The majority of mattresses in the market today are usually innerspring. These basically contain coils within the structure of the mattress and have supporting foam on the top and bottom of the mattress. The comparatively lower priced mattresses tend to use coils that are grouped together. However, these tend to transfer more motion and don’t contort to the body as well as the individually wrapped coils do. On the other hand, the budget mattresses are usually a bit towards the higher price but contort better to the body and transfer less motion allowing the individual to sleep more peacefully. Looking for a mattress with a higher coil count is always a better option. The latex foam is another kind of specialty foam that is comparatively more supportive than the memory foam. While it is a lot more durable and responsive to body types, it is not as great as the memory foam when it comes to relieving pressure and transferring pressure. Moreover, it is better at regulating temperatures as well. Occasionally you’ll find another kind within the latex foam category known as the poly foam which is more resilient but feels much harder. The latex foams are more commonly used today as they can be easily compressed for shipping to different locations. As the name suggests, the memory foam tends to hold on to your body structure longer than the latex foams which means these foams are less responsive as they take a comparatively longer time to come back to their original position. Due to its pressure relieving properties, memory foam is the most commonly used foam in the market today. There’s also a type of gel added to the memory foam which helps regulate temperatures better. 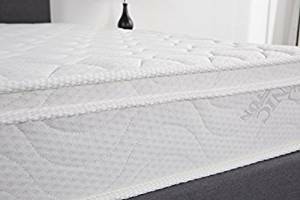 If you’re looking for a coil spring mattress that’s not only cheap but provides great value at its considerably low cost, then the Signature Sleep Contour 8-Inch Independently Encased Coil Mattress is a great option to consider. With the latest in-spring technology coupled with high quality foam, this mattress provides optimum relief to back ache sufferers in the long hours of the night. Moreover, compared to other mattresses in the market, the Signature Sleep Contour 8-Inch Mattress has a 40% longer lifespan. 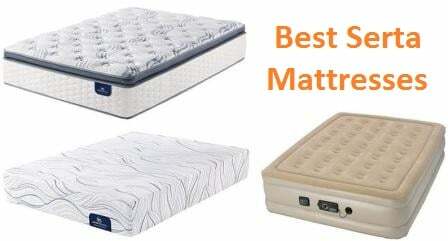 You can also check the list of the best memory foam mattresses. Latest In-spring Technology Within the mattress is a 7 inch thick layer of individually coated coil springs. These individually encased coils help establish motion isolation for their users. 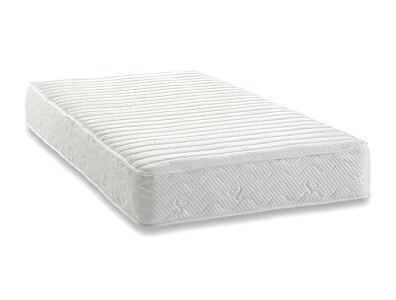 Above the coils is high density mattress foam that provides extra comfort and support. The overall mattress is covered with jacquard that contains a portion of polyester as well and helps disperse heat and decrease overall friction. Compared to the other spring coil mattresses available in the market, the Signature Sleep Contour 8-Inch Mattress is a great option for all light sleepers out there. This is because, the mattress is specifically designed to isolate motion and reduce vibrations to the maximum due to its individually wrapped coils that are extended into memory cell foam that isolates every coil and works independently. At its optimum price, the Signature Sleep Contour 8-Inch Mattress is built to help people sleep comfortably throughout the night without having to pull on and off the covers due to the extra heat buildup. The mattress is designed to pull in air from the side of the mattress which helps keep it cool by isolating the heat generated from your body and letting it disperse throughout the mattress. Great value for money especially with all its optimum features. Robust and long lasting for about 10 years. Latest in spring technology which isolates motion and dissipates heat. Requires airing for about 24 to 36 hours after being unpacked due to slight off gassing. Needs a bed foundation to hold the mattress in place. 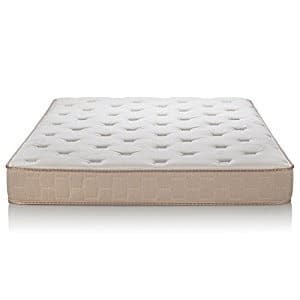 While memory foam mattresses are comparatively priced on the higher end, the Zinus 8-Inch Full Ultra Plush Memory Cloud-like Foam Mattress is a great catch for customers looking for budget friendly but high quality memory foam mattresses. With multiple foam layers and a customized sleep surface, the Zinus 8-Inch Memory Foam mattress provides its users an overall luxurious feel with full body support that will help you sleep better throughout the night. The Zinus 8-Inch Memory Foam mattress brings forth some great competition to its rivals in the mattress making industry. With its budget friendly price, this memory foam mattress is a great keeper with its sustainable plant seed oil base. It is strongly infused with green tea, charcoal and plant seed oil that not only helps keep your mattress fresh but also helps ward off any aversive odors that would be otherwise found in memory foam mattresses that use petrol based chemicals. The 8 inch memory foam has been popularly dubbed as having a medium to firm feel. Having thick memory foam is better than a thin one because it gives a cushiony comfortable feel. Moreover, it is important to consider the overall weight of the sleeper as well because heavy weight individuals will tend to be more comfortable on the Zinus 8-Inch Memory Foam mattress as it is said to feel softer to them. The multiple foam layering system shapes adequately around your body to give you added support and an overall luxurious feel. The Viscolatex Rsponsive foam is high density foam that allows the individual to sleep easy without tossing and turning all night. The foam is less responsive which means it will contort to your body perfectly and hold it up without placing too much pressure on the different parts of your body. Smartly shipped; the mattress is adequately compressed into a box to be shipped directly on to your door without damaging the mattress itself. Keeps motion localized and heat dissipated. May prove too firm for some individuals, especially light weight ones. The mattress may wear off over time which could further sink in the individual into the mattress. Not a good option for belly sleepers as may feel too firm and uncomfortable. If you can’t remember when you last slumbered well, then you ought to try the Signature Sleep Memoir 10 Inches Memory Foam Mattress. This mattress is known for its particularly thick mattress with 4 inch high performance visco-elastic memory foam that keeps the pressure off your limbs and lets your body sink into a perfectly serene sleep. Its optimally price will not prove heavy on your pocket; all the while assuring that your body is well balanced and comfortably supported throughout the night. The Signature Sleep Memoir 10 Inches Memory Foam Mattress is the perfect mattress for all those that have recurring back, shoulder or hip pains or any other joint related issues. The mattress is well designed to hold off the pressure from all these areas and contort evenly around your body’s curves so that you don’t feel exhausted when you wake up. The mattress is made up of optimum indentation load deflection memory foam that keeps the mattress firm enough to support your body. 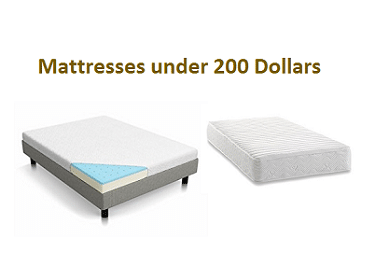 At such optimum prices if it means you get an eco-friendly memory foam mattress, then this is definitely a great deal not to let go of. The Signature Sleep Memoir 10 Inches Memory Foam Mattress is constructed with material that inhibits the release of volatile organic compounds into the environment. This means you don’t have to worry about inhaling any toxic chemicals during the whole period of your usage. Moreover, it’s hypoallergenic hence preventing the formation of may molds or dust mites or any allergens that could be potentially harmful to your health. 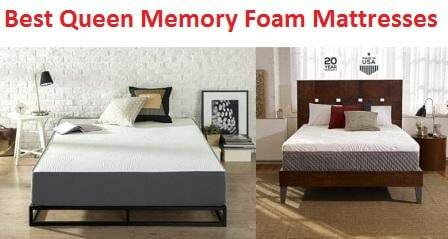 Compared to other high density memory foams, the Signature Sleep Memoir 10 Inches Memory Foam Mattress is less dense hence emits less aversive scents into the environment. You don’t have to worry about leaving it out to get properly aired before using it. However, it is recommended that you leave it overnight so that it decompresses to its original size after removing it from its packing. Meets federal flammability standards hence safety is ensured. Doesn’t consist of any cooling technology which means can get warm during the night. May feel considerably more firm to light weight people. 12inches depth may not suit all users. Compared to the regular innerspring or foam mattresses, the Sleep Master Ultima Comfort Memory Foam Mattress is a much better option because of two things. First, its build for people who need optimum support and comfort, due to their back and joint pains, which innerspring and regular foam mattresses fail to provide. And secondly, it’s great budget friendly alternative to the more expensive memory foam mattresses found in the market today. At such a budget friendly price, the Sleep Master Ultima Comfort Memory Foam Mattress is made up of three premium layers that provide extra support and comfort to the sleeper. Other than the base foam, the mattress comprises of a pressure relief foam that helps take off the extra pressure from your joints and lets your body sink into the mattress comfortably. Additionally, the mattress also comes with a firm removable cover that can be easily machine washed without getting damaged. Why do you need to pay a few extra hundred dollars for a mattress that is specifically designed to reduce your bodily pains when the Sleep Master Ultima Comfort Memory Foam Mattress does just that? Budget friendly and an excellent pain reliever, this mattress is a great option for people that occasionally have issues sleeping due to the extra pressure on their joints when they lay down. Occasionally people complain about the materials and chemicals used in the making of the memory foam. This is because they believe these toxic chemicals are the reason behind a distinct odor that most memory foams tend to give off. However the Sleep Master Ultima Comfort Memory Foam Mattress is suffused with Active Charcoal and Evergreen which absorbs the moisture generated due to sweating and neutralizes everyday odors around due with the help of a specialized green tea extract. Moreover, to reduce your everyday carbon foot print the manufacturers have made used Bio Foam in the making of the Sleep Master which is made with natural seed oil. Requires overnight airing so that the mattress can expand to its full size. Very ecofriendly with close to zero off gassing hence creating a fresh environment around the room always. Can cause sweating as may harbor body heat. Occasional complains about taking more than 48 hours to inflate to its original size. The Englander Finale innerspring Mattress is a popular choice among many Americans. It’s a fast selling product that is not only budget friendly but too good to be true in terms of the features that it offers. The tempered steel springs allow for better stability and support while being soft and cushiony. Free of any toxic chemical and heavy metals, this mattress is a great value for money in terms of health concerns. The Englander Finale innerspring Mattress is constructed on the basis of a 14 gauge 3 zone spring units which not only provides optimum support to every inch of your body but also makes sure that comfort is not compromised on. Each spring is individually wrapped which reduces overall noise as well as motion transfer incase the mattress is being shared. The springs adequately rotate to compliment your sleeping position. The supportive spring layering is coupled with a cozy foam top layer that embraces the sleepers’ body cozily and allows for great support at the same time. The overall firmness is medium to soft which a great variation for majority of the people is. It’s also a great option for heavy weighted people as it doesn’t sink into much cause of their oversize. It provides a great overall lumbered support without imitating a floor. Within the three separate spring zones specifically made to increase support, there’s a specific lumber region built to reduce lower back pain and take excessive pressure off from the body’s joints. The mattress is built to adequately wrap itself around the sleeper’s body without being too soft and letting them sink in. The quilted cover creates a comfortable surface for the individual and adequately distributes the weight. Free of mercury, lead and other heavy materials. If you’re looking for a mattress that perfectly embodies comfort, technology and budget, then the Classic Brands Cool Gel 8 Inch Gel Memory Foam Mattress will be the perfect mattress for you. This mattress is not only budget friendly but unlike its counterparts, comes fully operational with not one, but two sleep technologies that help you achieve sweet slumber like never before! Moreover, the mattress incorporates a cool gel layer that not only helps dissipate heat but also help align the spine and relieve pressure points. 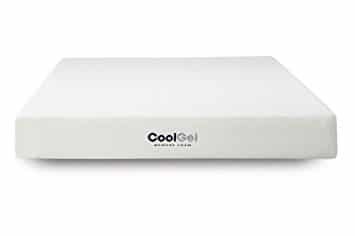 One of the most exciting features of the Classic Brands Cool Gel 8 Inch Gel Memory Foam Mattress is that incorporates the benefits of both a gel-infused memory foam and a flexible polyurethane foam. When it comes to firmness, the mattress will be comparatively more on the softer side due to its gel-infused properties. However, it will still be somewhat firm but not as firm as the other mattresses found in this line. The gel-infused layer is excellent at contorting adequately around the body without getting too hot. This helps reduce tossing and turning and in turn allows the sleeper to sleep comfortably throughout the night. Having a Gel infused layer means that there will be adequate levels of ventilation a long with proper temperature regulation throughout the night. The gel infused technology is very well known at regulating its own temperature which in turn effects its recovery time. Users claim that the memory foam manages to use their heat to contort itself around their body in a comfortable embrace rather than lead to overheating. When there’s proper ventilation and temperature regulation throughout the night, the user is able to sleep undisturbed throughout the night. Unlike other budget friendly memory foams fund in the market today, the Classic Brands Cool Gel 8 Inch Gel Memory Foam Mattress is extremely robust. Once again credit for being so resilient can be given to the its gel-infused properties that help keep the mattress cool and in turn reduce the amount of wear and tear it would otherwise have experienced. When people are tossing and turning considerably less throughout the night, the amount of damage to the mattress reduces phenomenally. Comes with a hypoallergenic removable cover that can be easily washed and keeps dust mite and mold from forming. Great value for money especially with all its optimal features. The gel-infused technology coupled with regular memory foam is great for ventilation and heat dissipation. May feel firm to some individuals that prefer their mattresses on the softer side. 24-48 hours needed for the mattress to reach its optimal level after unpacking. As the name suggests, the Best Price Mattress 8-Inch Memory Foam Mattress is a budget friendly, ecofriendly memory foam mattress that provides supreme comfort to its users without making them feel guilty of adding to their carbon footprint. After a long day at work, the body craves a cozy comfy environment to peacefully relax and finally sleep in. And this is what the Best Price Mattress has to offer its users! The three layer design triples the comfort you would get from a regular mattress. It provides sleepers with the right kind of softness and snugness that allows for a blissful sleep all the while supporting your body and holding it comfortably against its pressure points. Other than adequately distributing your weight across the whole mattress, it also manages temperature through the two inch ventilated foam. This is a great value mattress for side sleepers who occasionally complain about bodily pains due to excessive burden on their pressure points. People looking for ecofriendly natural options in mattresses will be very pleased with the Best Price Mattress 8-Inch Memory Foam Mattress because it is consists of plant based memory foam that is specifically made from green tea extract. Moreover, the overall mattress is manufactured using Bio Foam material which significantly reduced carbon footprint. The memory foam also consists of charcoal which helps keep the mattress fresh over its complete lifespan by absorbing excessive moisture from around it. The cover of the mattress is made out of a breathable and hypoallergenic bamboo fiber cover which is a great option for people with allergies. The poly jacquard cover can be easily machine washed. Its removable characteristic allows for easy maintenance and ease of mind especially for those concerned with hygiene and cleanliness. Its hypoallergenic properties make sure to keep allergens, dust mites and mold from forming. Great option for side sleepers as well as children. May feel lumpy to some hence hindering their overall comfort levels. May give out some odor upon unpacking and hence require proper airing before using. The transition from a kid’s baby bed to a big kid bed is a crucial milestone in parents’ lives. However, with the Signature Sleep Essential 6-Inch Coil twin Mattress you don’t have to worry about looking too hard or worrying too much about the price. This mattress amalgamates in-spring technology with the highest quality foam to bring you a mattress that is not only the perfect definition of comfort but also support within an optimum price range. Moreover, its ecofriendly and consists of hypoallergenic materials to ensure your kid’s health at all times. Probably the best part about this mattress is that it has an almost memory foam kind of feel to it due to its individually wrapped coils that adequately support your body’s frame. The Signature Sleep Essential 6-Inch Coil twin Mattress consists of 216 robust steel coils that are individually wrapped which help reduce motion disturbance but at the same time provide a strong support to the body overall by distributing the weight equally over the mattresses so no one part of the body is under distress. 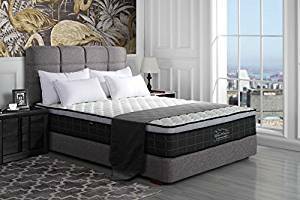 Moreover, the manufacturers have also added foam layering along with 12ILD foam padding in the quilted cover to enhance comfort levels so the sleeper can slumber without tossing and turning all night. This mattress is a great choice especially for people with allergies or even those who are just genuinely concerned about keeping the environment healthy and clean. Overall, the mattress is made up of material that are ecofriendly and without any heavy metals including lead and mercury. Moreover, it releases minimum VOC emissions in order to maintain indoor quality of air and reduce any allergic reactions. Mattress covers play an essential role in not only providing comfort but also maintaining health overall. The Signature Sleep Essential 6-Inch Coil twin Mattress comes with a soft polyester cotton jacquard cover that is removable. Being removable means you can easily take it off and wash it at your convenience. This will help eliminate any formation of mold and mildew along with keeping other allergens at bay. Moreover, a clean cover will ensure a refreshing night’s sleep. Doesn’t release any harmful emissions in the environment hence keeping the room’s atmosphere fresh. The mattress consists of a stiff portion that keeps the mattress from sagging and elongates its overall lifespan. Not heavy which means it’s easy to move around and even repackage in case of shifting to a new location or putting it away for later use. Will release some odor when unpacked but after adequate airing the odor will disappear. It’s small and cannot be used for prolonged adult life duration. A dual layered memory foam mattress is not only a cool and comfortable surface for a good night’s slumber but also a great support for the body. The Lucid 5″ Gel Memory Foam Dual-Layered Mattress incorporates a dual-layered technology that has a cooling layer above the memory foam itself. This way the user can enjoy double benefits within single memory foam at a decent budget market value. Moreover, you don’t have to worry about the mattress wearing off easily because the open cell construction ensures durability and longevity. And you can match it with the best memory foam pillows. Gel memory foam mattresses have the advantage of providing a cooling surface to its users while at the same time relieving pressure points. The one inch cooling layer is a great ventilating layer that promotes a comfortable temperature so the sleeper never gets too hot while sleeping. By drawing the heat away from the sleeper’s body, the cooling layer manages to dissipate it all over the mattress in order to create a comfortable atmosphere. Moreover, it also provides double support along with the memory foam base by absorbing extra pressure off of the body’s pressure points. 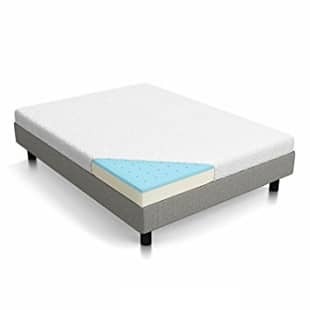 Below the one inch gel layer is a 4 inch high density memory foam layer that provides ample support to the sleeper and embraces their body in a comfortable manner without letting them sink in too much. 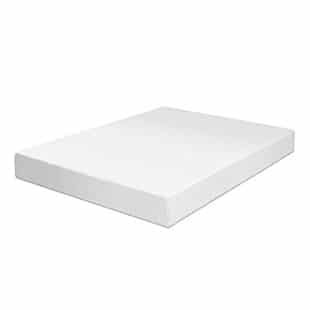 The memory foam base is made of open cell construction that adds to the overall life of the memory foam. And compliments the 25 year warranty the mattress comes with. The overall feel of the mattress is firm which means you don’t have to worry about the mattress sagging and losing its shape anytime soon. One of the best features of this mattress is the soft removable hypoallergenic cover that it comes with. This not only keeps the dust mites and mold away from forming but also helps keep the mattress overall fresh and odor free. The removable cover can be easily washed at any time. It is also breathable and allows air to pass through it easily which makes it really hard for any moisture to form. The cooling gel layer dissipates the heat and makes it easier to sleep. Great value considering the benefits this mattress has to offer. Great air flow that keeps dust mites from forming along with regulating temperature. The Modway Aveline 6″ Gel Infused Memory Foam will have you mesmerized with its premium features. The path to a perfect sleep is set; all you have to do is take it. This gel infused memory foam mattress is another great value for money option available in the market today. It comes with all the benefits you will find in regular memory foam along with all the benefits features in a gel infused foam. So basically, you will be able to reap the benefits of both kinds of foams in one mattress. The top most layer under the Upper most cover is the gel infused layer of the Modway Aveline 6″ Gel Infused Memory Foam that has the ability of dissipating your body’s heats and spreading it across the mattress to create a comfortable feel. The gel layer makes sure the mattress doesn’t get too hot by taking the heat away from the body so that you can easily sleep throughout the night. Moreover, the gel layer has the ability to easily conform to your body weight and hold your body easy and weightless. Under the gel infused layer is the memory foam layer that is 7 inches in depth and provides a not too firm and not too soft feel. The flexible polyurethane foam is durable and tested for any harmful emissions that occasionally get released into the atmosphere. You don’t have to worry about having an uncomfortable and unhealthy surrounding as the mattress releases hardly any fumes. Moreover, it compliments your body weight and releases pressure. It’s a great option for side sleepers as the memory form compliments the curves of the body rather than putting them under a lot of duress that could lead to back and joint pains. The mattress comes in a compressed vacuum packed packing which fits a compact box easily. Also, it is not too heavy and can be moved around easily. Due to its compressed form, the mattress may take 4 to 6 hours to fully expand to its actual size and become usable. Users don’t have to worry about hiring movers to bring in or take away the mattress due to its compact nature at the time of purchase. Removable and stretch cover that can be easily washed. Incorporates open cell technology that adds to the overall durability of the mattress as well as compliments the cooling technology. Free of any allergens and heavy metals that would otherwise be toxic to the health. May take longer than 6 hours in some cases to expand to its full size. Needs a platform, box springs or slated base to be placed in or on before usage. The Home Life Comfort Sleep 8-Inch Two-Sided Spring Mattress Green Foam Certified – Medium Firmness Queen has the perfect support thanks to the 15-gauge coils which have been separately and independently pocketed to allow independent movement of coils and resist the transfer of motion on the mattress. The foam used in this mattress is a two-sided foam. There exists a polyester layer between the mattress cover and the coil springs which guarantees a high level of comfort. The foam used in this mattress is 100% GreenFoam and it has been certified. The mattress is delivered in a compressed form and can even be rolled so that it can be shipped easily from one place to another. This mattress does not squeak at all and it is a lot more comfortable than many other 8-10-inch mattresses available in the market. This Home Life Comfort Sleep mattress has been engineered for real comfort as it has been designed with a multi-layered foam that relieves pressure on the body of the user. It has got independent and separately pocketed pads which make sure that the user’s body is fully supported. The mattress has been built to be as durable as possible and it is for this reason that the mattress is warranted for a 20-year period. The warranty is a limited warranty that covers defects due to material and workmanship. This mattress has been designed with independently pocketed coils that ensure that the motion of the sleep partners on the mattress is isolated and that there are reduced vibrations. This greatly enhances the level of comfort besides the coils providing support to the user’s body and weight and ensuring that there would be no roll-over. The mattress is available in different sizes such as the 6-inch Tight Top, 8-inch Tight Top, 8-inch Euro Top, 8-inch Pillow Top and in Medium Firmness, Comfort Firmness and Comfort Plush. The item weighs 30 lbs and the shipping weight is 35 lbs. The Classic Brands Individually Wrapped Coils Innerspring Pillow Top 10-Inch Mattress, Twin XL has been designed with individually pocketed and wrapped coils which are made of tempered steel. This provides a high level of support to the user’s body. A pillow-top cover which has been beautifully detailed and quilted with one inch of very soft comfortable foam allows for undisturbed sleep throughout the night. A buffer foam layer has been inserted to provide ultimate comfort so that the user never feels the coils. The firmness of the mattress is medium. the mattress is shipped in a compressed form and can be easily rolled for easy shipping. The package does not include the base or the foundation. This mattress provides ideal isolation of motion as all the tempered steel coils have been separately wrapped and pocketed. This ensures that motion on the bed is totally isolated from the rest of the mattress. Sleep partner does not get bothered by motion due to this feature of the mattress. The same feature also provides a high level of support to the body of the user. The mattress has been designed to provide maximum comfort to the user by the use of the one-inch soft comfort foam and the buffering provided by the comfort foam enables the user to not feel the coiled springs at all and sleep comfortably throughout the night. The premium comfort foam layer acts as a buffer and even if the mattress has been used for many years, the comfort level and the buffering stays. Thus, the mattress is able teprotide the user with ultimate comfort as well as support and keeps the user completely undisturbed throughout the night. 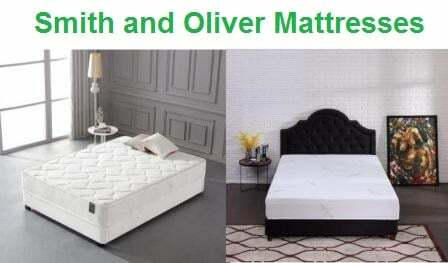 The mattress is available in different levels of firmness i.e. Extra-Firm, Medium-Firm, Medium-Firm with Plush Support, and Medium-Firm. The cover material types are Stretch Knit Tight-Top, Quilted Stretch Knit Tight-Top, Quilted Stretch Knit, Pillow-Top, Stretch Knit Euro-Top and Quilted Knit Cover Euro-Top. No transfer of motion of partners while sleeping on the mattress due to the individually wrapped coil springs which are separated from one another. 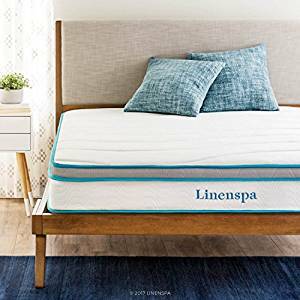 The Linenspa 8″ Memory Foam and Innerspring Hybrid Mattress, Twin has got excellent support for the user’s body as well as pressure point relief due to the use of the memory foam. Thus, it combines the support of the traditional mattress with the comfort of the modern foam mattresses. It is a hybrid mattress comprising of both the technologies at their best. Memory foam layer is placed on top of a 1.5-inch-thick layer of comfort foam thus the level of sleep provided to the user is of extreme comfort. 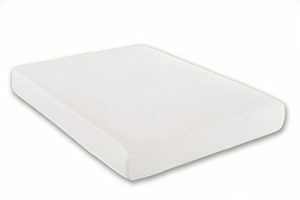 The memory foam has the characteristics of conforming to the user’s body at unique places and thus provides a high level of comfort. At the base of the mattress, steel coils which 6 inches in height provide the ultimate durability and support to the mattress. This particular design has the capability to distribute the weight of the user’s body throughout the coil springs that are under the body and contours with the usage of the memory foam. Many users like the traditional bounce of the coil mattresses and this mattress also provide that to enable them to enjoy it. The mattress has been designed to align itself with the user’s body and provide a high level of comfort. 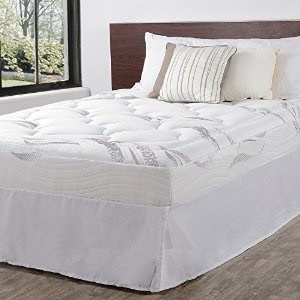 The memory foam that has been placed on top of a 1.5-inch-thick comfort foam with a 6-inch coil spring base conforms to the body of the user and keeps the user extremely comfortable throughout the night. The mattress a hybrid mattress and provides the comfort of a modern mattress with the memory foam and the comfort foam and at the same time lets the user enjoy the traditional bounce of a spring mattress. A strong base with a comfortable top foam lets the user enjoy both modernity and tradition in the best way possible. The Swiss Ortho Sleep 12-inch Plush Pillow Top & Pocket Spring Mattress – Green Foam Certified (Full) has a thickness of 12 inches and it consists of coil springs that have been individually and separately pocketed. These are then covered with a memory foam which is plush. This mattress which is hybrid of coil springs and foam technology boasts 9.5 inches of individually pocketed coil springs and 2.5 inches of a foam pillow top. These two together provide the mattress with its durability, comfort, bounce, and user body support, all at the same time. The mattress has the extra feature of very high breathability as the top layer of memory foam has been manufactured using bamboo fabric which ensures not just the flow of air through the mattress but also coolness to the user throughout the night. The mattress has the provision of being compressible in order to ship. This mattress has 9.5 inches of coil springs which have been separately pocketed and wrapped. This feature not only ensures very strong support to the user’s body and weight, it also enables isolation of motion and one partner’s movements do not disturb the other sleep partner. The independent coils ensure that the motion is felt on the coils which are directly underneath the person who is moving and this motion gets isolated within the area underneath the person. The other areas of the mattress and the partner who is sleeping would not feel the motion as it is confined underneath the moving person. The memory foam layer on top of the 9.5-inch coil springs is 2.5 inches thick and is able to contour as per the shape of the body of the user. This feature allows the user to have a maximum level of comfort possible. As the 9.5 inch the e coil springs act as the support base for this mattress, the user does not roll over despite being extremely comfortable. 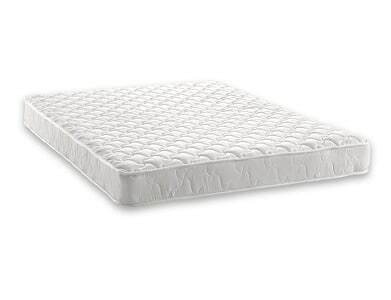 The top memory foam layer is manufactured using bamboo and thus it has the ability to breathe air. The inflow of air ensures coolness for the user throughout the night. 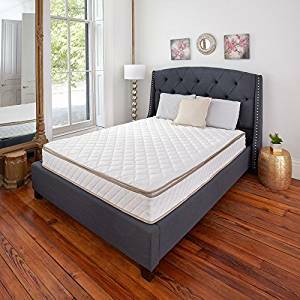 The Oliver Smith – Organic Cotton – Euro Top – Revitalize Sleep – 8 Inch – Pocket Spring – Luxury Mattress w Green Memory Foam Certified – Full is equipped with a total of 500 coil springs that have been individually pocketed. These coil springs are made out of 15-gauge steel and provide the strong and reliable support to the user’s weight and body. The mattress has also been provided with a top layer of 0.5-inch green memory foam for the extra comfort and softness that is characteristic to this mattress. There are a quality foam and polyester layer which is squeezed in between the coil and the cover which provides the highest level of comfort to the user. Superior softness is guaranteed by the utilization of Euro Top. This mattress has a Comfort-Firm feel. The mattress is recommended for those people who have issues related to their backs and who would want to have extra softness and comfort on top but a stable and strong base beneath to prevent a roll-over. The coil springs used in this mattress are made out of 15-gauge strong steel and are individually pocketed. This ensures not just firm support underneath the user’s body to prevent roll-overs, it also ensures that there is no transfer of motion from one side of the mattress to another or from underneath one partner to the other. The motion gets isolated due to the individuality of the 500 coil springs. The top layer of memory foam, as well as the polyester layering which is placed between the coil springs and top cover, ensures a very high level of comfort and softness for the user. The matters boast Euro Top and Comfort Firm feel and is therefore highly recommended for this who complain of back problems and require both a solid base to support them and extremely soft top to ensure comfort. The mattress is equipped with a GreenFoam which has been certified. It ensures quality products which have gone through testing and trials. They conform to environmental standards and also protect the health of the user. This certification is extremely important from a human-ecological point of view.